Android leanback support libraryはメタ情報をヘッダとして扱い, 抽象化する. 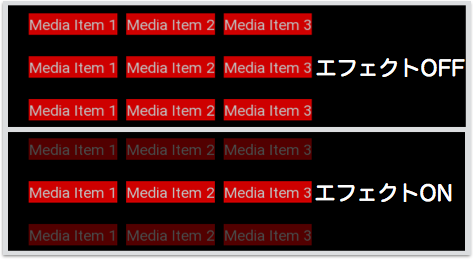 Rowに(先述のような)Menu Item 1, 2, 3 … を追加したければ, サブクラスのListRowクラスを使用する. A row in a RowsFragment. This is the base class for all rows. You will typically use a ListRow, but you may override this class for non-list Rows. Get the HeaderItem that represents metadata for the row. Set the HeaderItem that represents metadata for the row. Set the id for this row. A header item is an item that describes metadata of Row, such as a category of media items. Developer may override this class to add more information. Returns the icon for this header item. An abstract Presenter that renders a Row. When a subclass of RowPresenter adds UI widgets, it should subclass RowPresenter.ViewHolder and override createRowViewHolder(ViewGroup) and initializeRowViewHolder(ViewHolder). The subclass must use layout id “row_content” for the widget that will be aligned to the title of any HeadersFragment that may exist in the parent fragment. RowPresenter contains an optional and replaceable RowHeaderPresenter that renders the header. You can disable the default rendering or replace the Presenter with a new header presenter by calling setHeaderPresenter(RowHeaderPresenter). A Row is selected via setRowViewSelected(Presenter.ViewHolder, boolean). The event is triggered immediately when there is a row selection change before the selection animation is started. Subclasses of RowPresenter may override onRowViewSelected(ViewHolder, boolean). A Row is expanded to full width via setRowViewExpanded(Presenter.ViewHolder, boolean). The event is triggered immediately before the expand animation is started. Subclasses of RowPresenter may override onRowViewExpanded(ViewHolder, boolean). RowPresenter provides OnItemSelectedListener and OnItemClickedListener. If a subclass wants to add its own View.OnFocusChangeListener or View.OnClickListener, it must do that in createRowViewHolder(ViewGroup) to be properly chained by the library. Adding View listeners after createRowViewHolder(ViewGroup) is undefined and may result in incorrect behavior by the library’s listeners. When a user scrolls through rows, a fragment will initiate animation and call setSelectLevel(Presenter.ViewHolder, float) with float value between 0 and 1. By default, the RowPresenter draws a dim overlay on top of the row view for views that are not selected. Subclasses may override this default effect by having isUsingDefaultSelectEffect() return false and overriding onSelectLevelChanged(ViewHolder) to apply a different selection effect. Return whether this RowPresenter is using the default dimming effect provided by the library. Subclasses may(most likely) return false and override onSelectLevelChanged(ViewHolder). Set the listener for item click events. A RowPresenter does not use this listener, but a subclass may fire an item click event if it has the concept of an item. The OnItemClickedListener will override any View.OnClickListener that an item’s Presenter sets during onCreateViewHolder(ViewGroup). So in general, you should choose to use an OnItemClickedListener or a View.OnClickListener, but not both. Set the listener for item or row selection. A RowPresenter fires a row selection event with a null item. Subclasses (e.g. ListRowPresenter) can fire a selection event with the selected item.